Chiang Mai is a popular base for activities in Northern Thailand amongst backpackers. With everything from zip lining, cooking classes, bamboo rafting and visiting elephants to choose from, me and my limited time frame were completely overwhelmed. In the end I opted for one of the lesser known things to do in Chiang Mai and in my opinion, one of the most interesting: a Thai monk chat. What is a monk chat? Being a Buddhist country, monks aren’t hard to come across in Thailand but for many tourists, monks remain shrouded in secrecy. 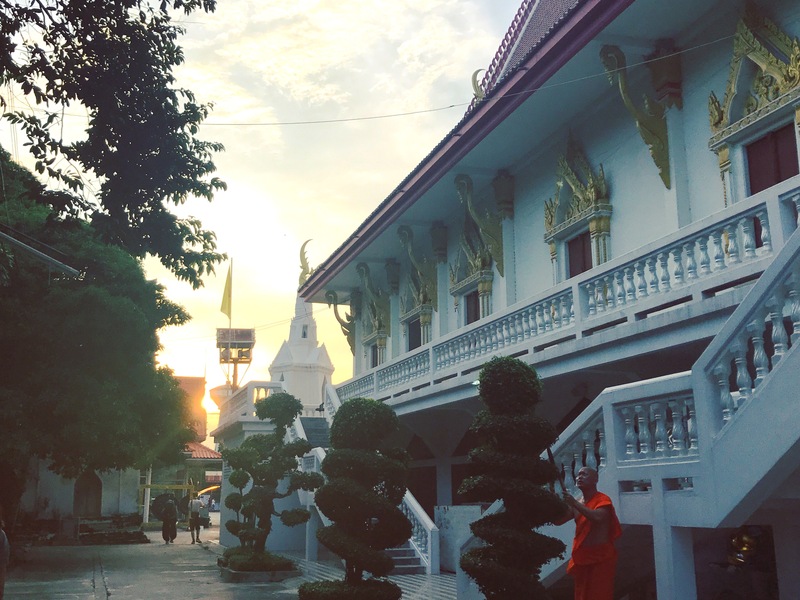 However from Monday to Friday tourists can visit the Buddhist university campus at the Wat Suan Don temple in Chiang Mai and talk in a one on one session, or quite literally, a monk chat. The sessions are held with young monks and are a chance for you to learn about their way of life and their beliefs. In return it’s a way to learn about your own culture and a way in which to practice their English. Monk chats are free but it’s polite to make a small donation. At first the experience was a little daunting. It wasn’t until I got into the temple that I thought, “what am I actually going to ask this monk?” Of course once I got in, the questions kept coming. Here’s what I learnt from my Thai monk chat. 1.What do monks do most days? Every day starts early for a monk. They wake up at 4am each morning and then pray and walk through the town to receive offerings from the public. They have lessons and then give thanks for their food and eat lunch. They spend the afternoon reading and teaching and then go to bed early at nine. 2. How many rules do monks have to live by? There are 227 rules that monks must follow. 3. Who can become a monk? Most Buddhist Thai boys will be a monk for a short period of their life. If a person wants to become a monk much later in life, they generally will become a novice. A novice only had 10 rules. 4. Do you have a rest/ sacred day? There is no set special day in the week, as Sunday is for Christians. Rather their sacred days are determined by the moon for example, full moon, half-moon and quarter moon. What they eat is dependent on what they get given on their walks in the morning. Monks should accept all the food they are given, even if they do not like it. This food can be shared out amongst them back at the temple. One of the Buddhist rules is that they must not harm another living being. I asked, why do some monks eat meat? Apparently as long as they do not do or the see the killing themselves, it is ok.
7. Do you ever get free time? Monks are allowed leisure activities in their free time however they must participate in the ‘right kind of activities’. They are allowed phones and social media to communicate but it should be used only for that. The monk I spoke to told me that he just likes to nap and listen to music in his spare time. 8. Are you allowed to travel? Monks are allowed to travel but it must not just be for leisure, there must be some greater reason, for example to learn or to teach. 9. Why do people become monks? He said there are many reasons why people choose to become Monks. One is they have strong sense of belief. Another is that the level of education they receive is much better in monk school than in general schools. He also said many boys choose to be monks after suffering a loss such as the death of a family member. 10. I asked, what buddhist values should I take with me today? He said everyone should adopt some Buddhist values in their life. He said we should all focus on spreading health, happiness, kindness and compassion in our lives. If there is no happiness in your life than that is no life. * I hope you enjoyed this blog post. Feel free to send me a message or leave a comment below if you have any questions. I’m happy to help. Feel free to check out the rest of my blog for more travel tales. I focus on 20 something travel and cafes around the world. Alternatively browse my posts by destination.